Beijing (CNN) -- Money rewards are coming in for a woman who rescued a bleeding toddler left for dead last week by multiple passersby in southern China. 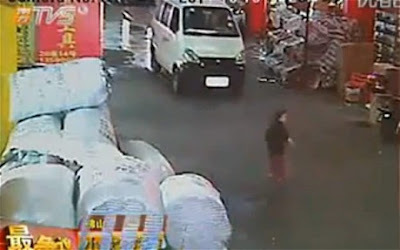 Two hit-and-run drivers rammed into Wang Yue, 2, one after another, as she walked on a narrrow street in Foshan. More than a dozen people walked, cycled or drove past as she lay bleeding in a busy market, sparking a global outcry on the state of morality in a fast-changing society. Wang is in critical condition, her brain showing little activity despite earlier subtle movements in the lower body, said her mother, Qu Feifei. Good Samaritan laws in China But despite the many villains in the story, it has also turned the spotlight on an unlikely hero: A 58-year-old scavenger. In the video that has sparked outrage globally, Chen Xianmei moves the baby to safety, becoming an instant symbol of understated decency in a nation analysts say is obsessed with climbing the economic ladder. "I didn't think of anything at the time," Chen said Sunday. "I just wanted to save the girl." Two government offices in Guangdong province, where the hit-and-run occurred, offered the Good Samaritan a total of 20,000 yuan (US $3,135), according to state-run Xinhua news agency. Wang's mother has said she does not understand the behavior of the passersby, but wants to focus on the positive. "Granny Chen represents the best of human nature," she said of her daughter's rescuer. "It's the nicest and most natural side of us." My view... The above story has captured much attention worldwide. Believe me, this could happen in any part of our world. The fact of life is... The rich has no time for others, while the poor still has empathy and concern. As Malaysian we claimed to be kind but when we see accidents on the road, you could observe few motorists who would be willing to give a hand to the injured. The one who would stop to assist are normally the motor cyclists. The expensive driven cars would never be bother to look at them. Reasons... They are afraid too much time could be incurred, or their beautiful cars might be subjected to blood stains which might be difficult to remove later. Either the injured have to wait for the ambulance to come or lucky enough to have a Samaritan who would stop his motor car and fetch the needed victims to the nearest hospital. I darn to write this because I had experienced two times when I saved two lives who were badly hurted on the road. I can't imagine how painful it is to lost a child. Love our children and teach them the Language of kindness, so that our world is a better place to live my dear. I have seen the footage over and over again. I just cannot understand RICH CHINA, POOR CHINESE mentality. I am very, very sad for Yue Yue and her family. Over the radio, just heard Yue Yue passed away. Her brain was dead in the first place. My heart in pain and my mind felt sorrowful too. ...yes, Sir.Thanks for the wonderful advice.